It’s day 14 for Ben’s eggs today. I candled all three and they’re doing just perfectly. There’s only 14 more days left, and we should have goslings. One of the eggs under Ben. (the black spot in the center of the egg) very well in this picture. 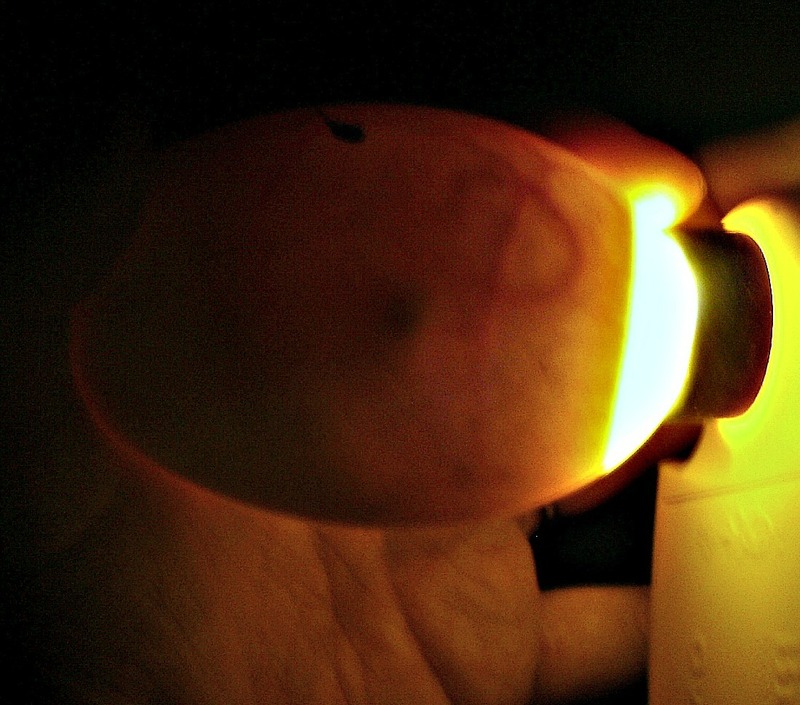 Of course, I also candled two eggs from each of the ducks’ nests. Three of the four eggs were developing on target and the embryos were actively moving today. 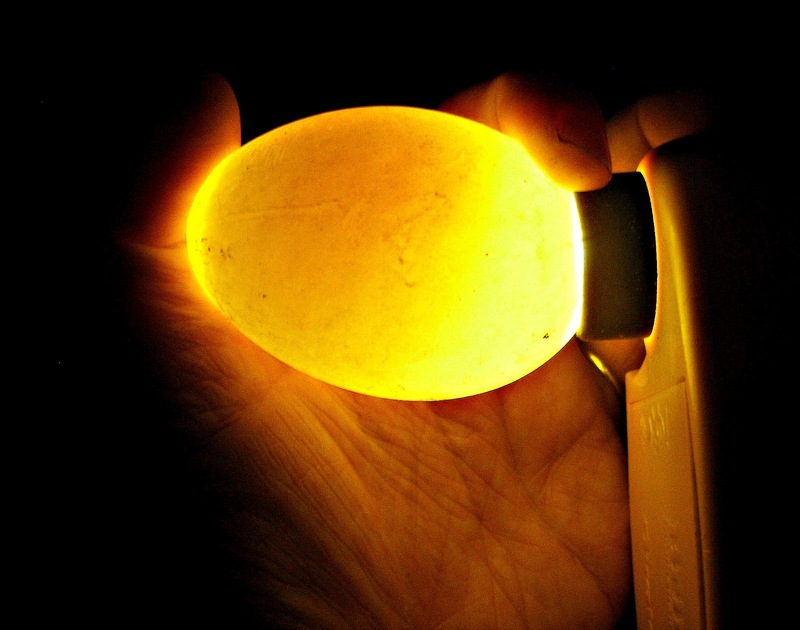 The fourth egg happened to be a dud (probably infertile) that showed no sign of any blood vessels that would indicate development. One of the developing duck eggs. Let me tell y’all a little about Ben. She is the sweetest broody that I’ve ever seen. She doesn’t care if I take her eggs to candle them, she doesn’t hiss, bite, or charge at me. It’s amazing to me because of her breed (she’s an African goose and they’re supposed to be one of the more aggressive breeds). Ben does honk just a bit, though, when I bother her and her nest, but I can handle that easily. Ben’s best friend, Aubrieanne, is another story entirely. You see, she is not a nice broody. To tell the truth, she’s not completely broody, yet. She’s sort of in that half-way mood where she’s spending a majority of her time during the day on her nest or near it, but hasn’t decided to commit to spending 28 days of her life tending to eggs. Even though she’s not completely broody, yet, she is proving herself to be a protective mother. She doesn’t want anyone anywhere near her nest, let alone touching it. Where Ben doesn’t hiss, screech, bite, or give chase, and only honks a little . . . Aubrieanne does all of that and announces to anyone that’s willing to listen in a very loud honk/screech when someone (whether they be human, duck, chicken, or cat) even looks at her nest. Aubrieanne hissing at me today. she’ll develop a pretty white mask on her face. It’s a little odd that she’s so overly vigilant with her nest and Ben isn’t. You see, Aubrieannie is a Pilgrim goose, which is a very lovely, smaller breed that is known for being calm, sweet-natured, and personable. That usually describes her temperament to a tee, but apparently she morphs into ninja goose when it comes to her eggs. But I suppose I would be a little protective, too, if I had picked out the perfect spot for a nest, laid my first eggs, and was contemplating becoming a mother. Just like with Ben, though, her eggs aren’t fertile. I’m very tempted to buy a few Pilgrim eggs to stick under her when she does start setting, instead of the Toulouse eggs. You see, Pilgrims are one of the rarer breeds of geese and also one of the few auto-sexing ones (females are grayish and males are white with beautiful blue eyes). They’re listed as being critically endangered by the American Livestock Breeds Conservancy. Aubrieanne happens to be the only one of her breed that we own. I’ve planned, ever since she hatched out last year, to add another Pilgrim female and a male to our flock, and I have finally found someone else that owns Pilgrims and has hatching eggs near us. . . well, a couple of hours away, but that would be better than having eggs shipped from several states away. I wonder what Aubrieannie would think about hatching out her future mate? Since she disdains the company of the other geese (other than Ben, that is,) and had rather hang out with the ducks, that may be the only way she ever has a boyfriend. I’ve noticed that this post has had quite a few visitors since it was published in March from people searching for everything from goose to peafowl candling pictures, and it has become the #1 viewed post on my blog. I want to thank all y’all for visiting . . . Ben and Aubrieanne want to thank you, too, for making them #1 lol. I also wanted to provide an easy to follow list of links to all of the other posts in the order that they were published that contain candling pictures. Spring has sprung. This post has pictures of the ducklings and goslings that were hatched. Sebbie & Pilgrim Eggs – Day 21 This post also has a picture of a candled peafowl egg that was on day 7. Sebbie & Pilgrim Eggs – Hatched. 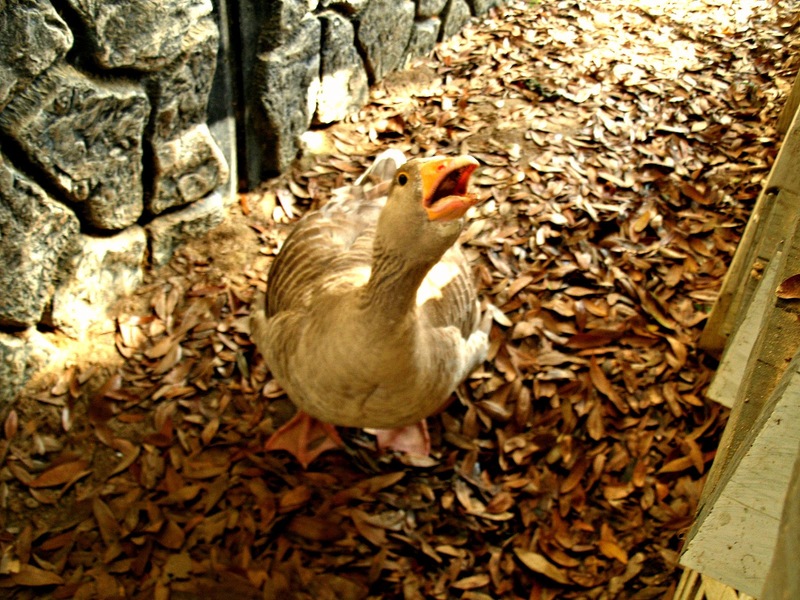 This post has pictures of our Sebbie & Pilgrim goslings. First Peachicks. 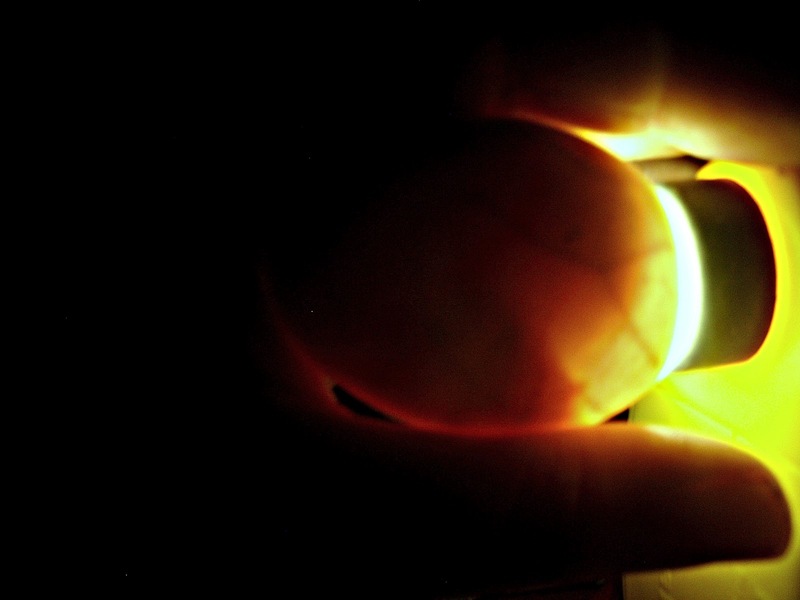 This post has a picture of an internally pipped peafowl egg. Next post: Being good is so hard. Sounds like these two have swapped personalities!